Vivo Nex is set to go on sale in India today. The handset will be available for purchase through Amazon India and the official Vivo online store with a price tag of Rs. 44,990. It will also be available offline through select partner stores and Vivo Stores across the country. 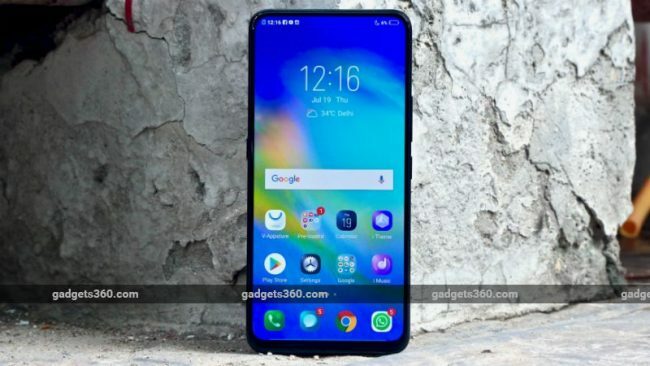 Launched earlier this week, the Indian variant of the Vivo Nex is the rebranded version of the Nex S, which is the top-end model in the Nex-Series of smartphones that debuted last month. The model comes with 8GB of RAM and has a Snapdragon 845 SoC. However, as the USP, there is an elevating selfie camera that pops up from the top. The Vivo Nex price in India has been set at Rs. 44,990, and it will go on sale through Amazon India and the official Vivo E-store. Select partner stores and Vivo Stores across the country will also start selling the handset starting today. Pre-orders for the handset were started following its launch on Thursday. As far as the launch offers are concerned, Vivo is offering an additional discount of Rs. 5,000 on an exchange of an older smartphone and one-time free screen replacement. The smartphone also comes with no-cost EMI options for up to 12 months, Rs. 4,000 instant discount on purchases made via HDFC credit (EMI and non-EMI) and debit card (EMI-only) purchases, Rs. 1,950 cashback (39 vouchers worth Rs. 50 each) on Rs. 198 recharges as well as a free premium security subscription from Reliance Jio. There is also an assured buyback offer of Rs. 22,495. The dual-SIM (Nano) Vivo Nex runs FunTouch OS 4.0 based on Android 8.1 Oreo and features a 6.59-inch full-HD+ (1080×2316 pixels) Super AMOLED ‘Ultra FullView’ display with a 19.3:9 aspect ratio and an ultra-thin bezel design. Under the hood, there is an octa-core Snapdragon 845 SoC, coupled with 8GB of RAM. The pop-up selfie camera on the Vivo Nex carries an 8-megapixel sensor with an f/2.0 aperture and supports features such as Portrait Bokeh, AR Stickers, and Face Beauty. Further, there is a dual rear camera setup sporting a 12-megapixel primary sensor along with an f/1.8 aperture, four-axis OIS, and dual-core tech for 24 million picture elements. The camera setup also includes a 5-megapixel secondary sensor with an f/2.4 aperture. There is also an LED flashlight. The rear camera sensor also supports features such as Portrait Bokeh, AR Stickers, Slow Motion, and Backlight HDR. For storing content, the Vivo Nex has 128GB of onboard storage that isn’t expandable via microSD card. The smartphone has dual 4G VoLTE, Wi-Fi 802.11ac, Bluetooth v5.0, GPS/ A-GPS, USB Type-C (with OTG support), and a 3.5mm headphone jack. Further, sensors on board include an accelerometer, ambient light sensor, digital compass, gyroscope, and proximity sensor. There is also an in-display fingerprint sensor. Besides, the smartphone packs a 4000mAh battery and measures 162x77x7.98mm.